The Daiso store in Richmond is dangerous to my credit card. It starts off so innocently (as these things often DO) with one package of three very pretty (and hoarded) fabric sticky tapes. I just thought they were so pretty and sticky and what would I do with them? I see that the Filofax / Midori/ Planner crowd merrily colour codes and covers their week/month/year sections with various washi tapes and COVETS them. I am here tonight at this meeting of the Washi Tape Addicts Anonymous (WTAA) to say that Yes it is bigger than all of us and yes we should give our sig others control of the credit card (when we can remember to do so) and I am going to try and see if I can limit myself to ordering or buying just ONE tape a month, no scratch that, every two weeks, no no, every week! All bets are off when we are on the mainland (like today) and we do a trip to Daiso. 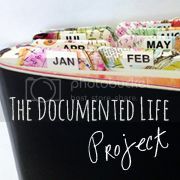 We came away with only spending 80 dollars as opposed to 100 and no it was not ALL on washi tape! 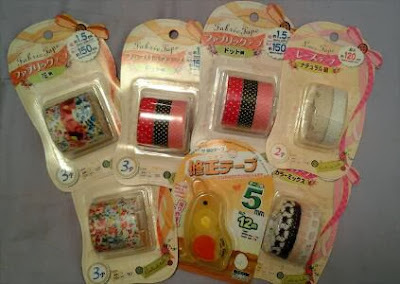 The photo shows my Daiso washi tape 'haul' with the cutest correction tape 'chick' I had ever seen. Each one of those packages was 2 bucks. See what I mean? Repeat after me; Daiso Is Dangerous. Blessings to all those addicted to this delightful obsession! I can't believe we both wrote about washi tape on the same night! *Twilight Zone theme music* But, then again, you know what they say about great minds! Great price on those tape sets. And I LOVE the correction tape chick!!! !